Goal 12.5: By 2030, substantially reduce waste generation through prevention, reduction, recycling, and reuse. The Scientific Center of Kuwait (TSCK) is a cultural achievement and educational facility enriched with knowledge, which portrays fascinating architectural design that reflects Islamic art and culture. The walls contain ceramic depictions of stories that tell of Kuwait’s history. The main building is comprised of three main attractions: Aquarium, Discovery Place, and IMAX Theater. 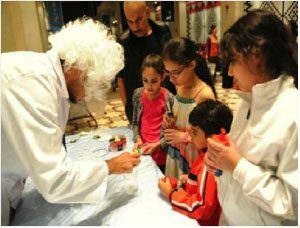 TSCK is recognized as a prominent, trusted, and entertaining destination in the Middle East and North Africa for informal science education and environmental awareness for people of all ages. It was established with a mission to simplify science and promote environmental awareness in a fun-filled learning experience. 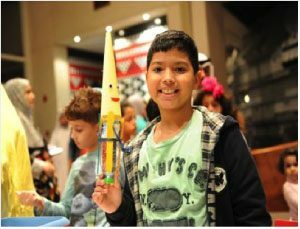 In addition to the three attractions and different exhibits they hold, our visitors are enriched by programs and annual events preformed in the field of science, technology, and environment offered for school groups and the public. 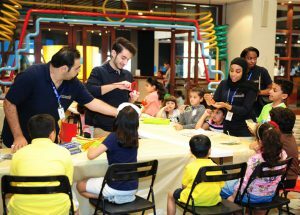 Our activities have been designed to introduce children to science in a playful and entertaining manner with an interactive approach. 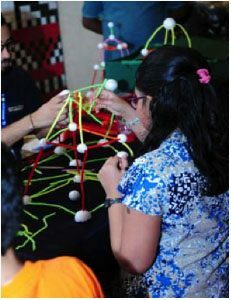 Hands-on Lab, Design a Challenge, and Animal Days are all activities engaging children in science dialogue. Other activities deliver an important social message regarding environmental conversion and reducing waste by three Rs (Reduce-Recycle-Reuse).